Norwegian Pancakes are light, fluffy, and a great twist on traditional pancakes! They are basically just a thicker crepe. It is also similar to a Dutch Baby (German Pancake), but it's cooked on the stove top! I use the same basic crepe recipe, except I add a little more flour, some vanilla extract, and a little sugar! I love using a cast iron pan for these pancakes. It browns them so nicely and since it is naturally non-stick it makes it really easy to flip them! In order to make the pancakes thicker than crepes, just add more batter to the pan! If you were making a crepe, you would add a small amount of batter and swirl or spread it to make it as thin as possible. Just add a little more batter, spread, and then flip! They're much easier than crepes and are a little heartier! 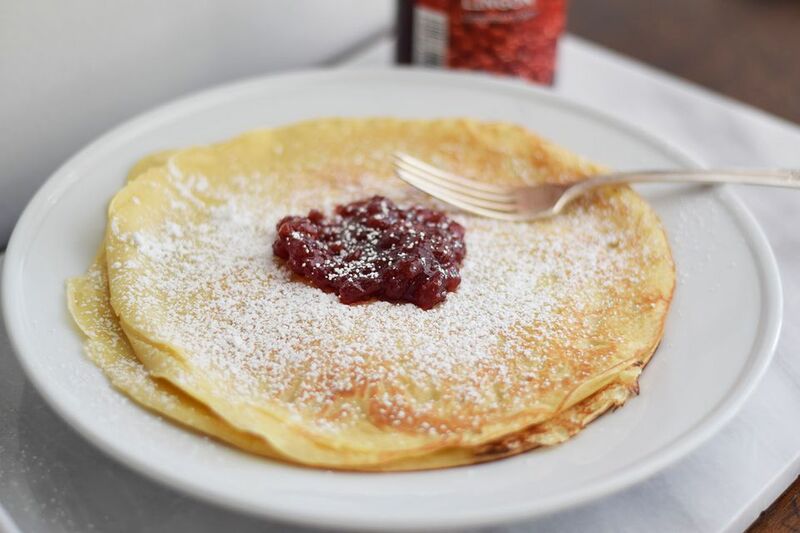 I love topping these pancakes with the lingonberry jam from IKEA. It's so delicious and compliments the flavors of the pancakes really nicely. You can easily substitute any other jam for this recipe. Raspberry and blackberry also taste delicious! I also like to sprinkle them with powdered sugar, but this is optional. You can also roll them with the jam inside! Beat together the whole milk, water, and eggs in a measuring cup until the ingredients are completely combined. Whisk in the sugar, melted butter, and vanilla extract. Place the flour in a separate bowl. Slowly add the liquid mixture to the dry mixture, whisking as you incorporate them together. This will ensure a smoother batter. Instead, you can also add all of the ingredients to a blender and blend until smooth. This will also help prevent lumps! Great your cast iron skillet with butter or cooking spray. You want it at about medium heat, so the pancakes will not burn. Place about 1/2 cup of the batter into the center of the skillet. Use a wooden spoon to spread the batter evenly in the pan, or hold the handle (use a pot holder!) to swirl the batter, so it completely coats the bottom of the pan. Let the pancake cook for about a minute and then flip with a spatula. Cook for another minute and then remove from the pan. Sprinkle with powdered sugar and top with lingonberry jam!